Ocean Optics and Mavericks Diving. Your One Stop London Dive Centre. 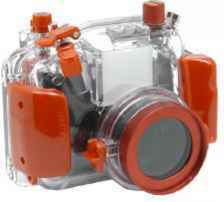 At our new central London showrooms you'll discover only the finest underwater camera equipment. As underwater photographers ourselves, we have the experience to select the products that will help you make great underwater images. And our reputation, built over a quarter of a century, means we never have to offer second best - top designers and manufacturers want us to represent them. We're exclusive UK agents for Subal, Nexus, Subtronic and Inon, as well as major stockists of Canon, Sony and Olympus housings.But the best equipment is nothing without the best advice. At Optics we'll never hard sell you or push you to buy something you don't need. It's our passion for honesty and service that's won us the custom of so many of the Uk's top shooters. Now we're taking those same qualities and applying them to diving equipment. So when you visit Ocean Optics, you'll also have access to superb scuba and freediving kit through our sister company Mavericks Diving Ltd. 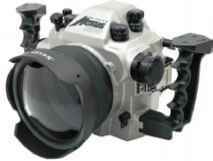 Ocean Optics and Mavericks Diving. Your one stop London underwater and recreational diving centre. The arctic is not the first destination you will think about when planning a dive trip. 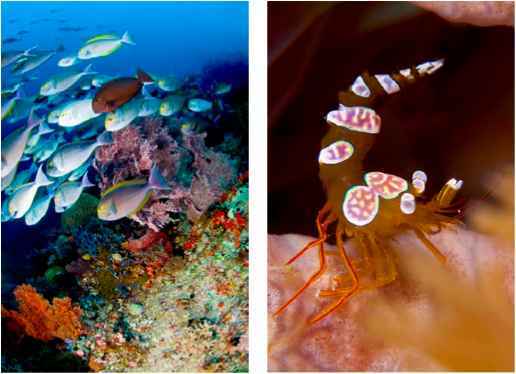 Many divers from all over the world choose (sub)tropical destinations because of it's colourfull flora and fauna. The adventurist who dares to go to the most northern part of the world will encounter a unique aquatic world. The trip to the islands of Svalbard will go through Norway. There are regular flights to Svalbard starting in Oslo or Troms0. The best time to travel to Svalbard is june - august. Besides these months the climate is extremely cold and dark. During the summer the sun stays up 24 hours a day. The sun just makes circles above you but will not drop. The average temperature during the summer time is 6 degrees Celsius. Not really comparable with the climate on a tropical island, but it's not too bad with a warm shirt and a pair of gloves. A visit to Svalbard will start with one or more days in Longyearbuyen. This is only a small village although this is the capital of Svalbard. There are 4 hotels/pensions, some restaurants and cafe's and a small shopping centre were you can get almost everything you need. The buildings are mostly build from wood and painted in beautifull, typically Norwegian, colours. Svalbard is covered with a thick pack of snow almost all year around. This makes that almost all houses are build high above the ground. The ground is always frosen. This is why electricity and water lines are built above the ground. On first sight this looks strange; but the harsh climate during winter time leaves no other way.. It's best to book a trip on the "Professor Molchanov" when you want to go diving at the Arctic. 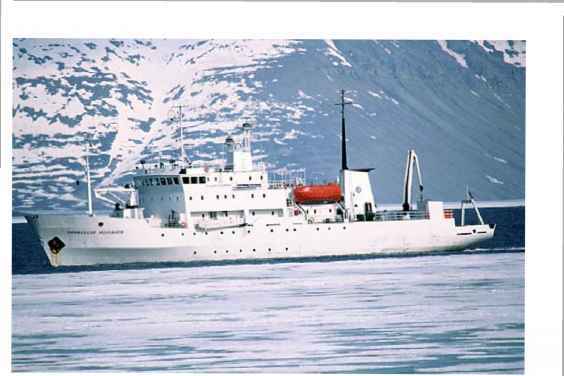 The Professor Molchanov is a modern and comfortable oceanographic research vessel. The vessel was build in Finland in 1983. The vessel is operated by an enthusiast Russian crew, all highly experienced in ice navigation. It is charterd by the dutch company "Ocean Wide Expeditions". The "Professor Molchanov" is an ice-strengthend vessel. Two Zodiacs are available to bring the divers to the dive sites. breaker but capable of sailing through a meter of ice. The size of the vessel and it's ice capabilities make it possible to enter the fjords of Svalbard very deeply. The tours to the arctic on the vessel last one week. Diving is only offered two weeks a year. The vessel has room for 52 guests, only 16 of them can be divers. This gives a mixture of naturalists, bird watchers and divers on board. The international expedition leaders and guides are highly knowledgeable, helpful an dedicated to the protection of the environment. 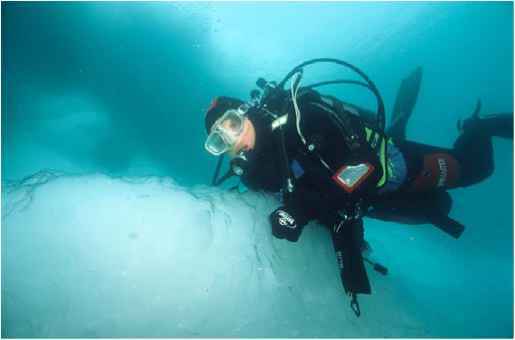 Diving trips around Svalbard are true expeditions. A plan of the tour is made in advance. But divers and other passengers have to be flexible since ice and weather conditions influence the route the vessel will sail. The actual program of the expedition will vary to take the best advantage of local conditions, spontaneous opportunities and wildlife. The dive sites that will be visited are not all exactly known in advance. This gives way to very explorative diving on sites where no one has ever dived before. and belugas. We have seen all of these animals. Sometimes not very near, but we have seen them; so don't forget your binoculars. An average day on board of the "Professor Molchanov" is quite busy. Breakfast is being served around eight in the morning. A minimum of two tours a day will be organised by the expedition leader. These can either be a land based tour or a dive trip for the divers that are on board. For the divers it's always hard to make a choice, go diving or make a land tour. Both are very beautifull. The north pole doesn't consist of land as opposed to the antarctic. The Arctic is a huge area. There is no clear agreement on its extent, no simple geographical or even political definition of its territory. Fact is that the most northern part of the world is covered with ice. This ice will melt during the summer and will freeze up during the winter. In august it's possible to circumvent the islands of Svalbard, in early summer this is not possible. One of the goals in saling the "Professor Molchanov" is to get as northern as possible. We reached the pack ice at around 80 degrees. From there on it was impossible to sail further north bound. Diving at the artctic is an impressive experience. Because the dangers of moving ice, diving at the arctic is only possible for a few months per year. Every day two different dives sites are picked by the expedition leader and the dive guides. These sites are not known in advance, as the exact route of the vessel is not known in advance. Sometimes you dive at sites where no one ever dived before. For a couple of dives the sites are just picked on good luck and depths of the sea floor. There is always an element of the unexpected. Two Zodiacs will bring the divers to the dive sites. You don't have to carry your gear around, just put it in the zodiacs which are located on the big deck. The zodiacs are then hoisted into the water. 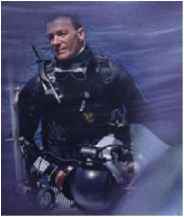 Only experienced dry suit divers, with at least 20 logged dry suit dives, can join the tour. Your gear will be checked by the dive guides. 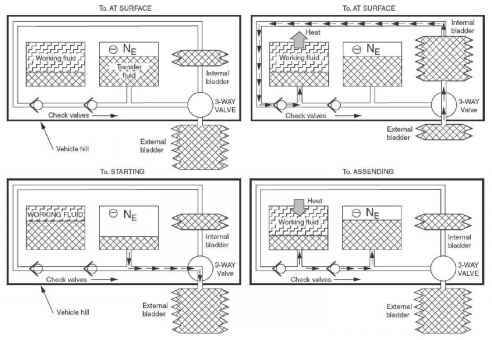 You will at least need two regulators, consisting of a first and second stage. A maximum number of five hoses is allowed. The first dive is the traditional checkup dive. This will be at an easy place where all equipment is tested for the rest of the week. The water temperature is arround 0 degrees Celsius. Therefore good preparation of your gear and warm undergarment is needed here. The underwater world of the Arctic is very varied. Most of the the dive sites feature enormous kelp plants. Between the kelp a lot of critters can be found, which can be: small fish, amphimipods, small swimming nudibranches, sea-slugs, nudibranches, sea urchins, hermit-crabs, starfish, spidercrabs and a lot more. Other dive sites show a different sight. A rocky sea bed, which at first seems desolated, forms the basis of this part the northern ice sea. 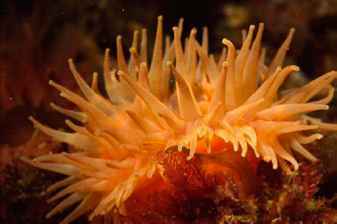 On these rocky surfaces a lot of collourfull anemones and sea dahlia's can be found. Be prepared, on many of the dive sites you will experience enormous swells. These swells are noticeable on to about 10 meters below the surface. The swells combined with diving through the kelp-forrests makes the dives very special. At the end of the dive you will wonder: "was it the kelp or the sea floor that was moving?" You will sail through the ice all week. Big icebergs will float by. An ice dive along one of these enormous blocks of ice must be part of the tour. The crew will search for an iceberg that has landed on the sea floor. This way you are sure the ice will not tilt while the divers are underwater. The iceberg also has to be reasonable free of other blocks of ice. Moving ice can close the open water making your ascent impossible. A bit of sun light will make the underwater scenery even more beautifull. Some icebergs are almost jade coloured, making you forget the coldness of the water. Close encounters with seals are possible for snorklers. During our tour a group of seals was located northern of Prince Karls Forlandet. They were living at a place where the water was only 1,5 metre deep. Some of them were lying on the rock's, others were playing around in the water. The animals are not shy at all and you can approach them very closely. Now you can take pictures of them using a wide angle lens. Shots that are impossible for the photographers on land who were following us with their big tele lenses. be visited during the tour. This dive will be the last dive of the drip and will be made during the way back to Longyearbuyen. Saga-reef is a very complete reference of all there is to see while diving at the arctic. The first 8 meters are covered with enourmous kelp forrests. From 8 meters down you can find a wall that leads you into deeper waters. Across this wall you can find a lot of marinelife: anemones, sea dalia's in different collours make you think you're in the tropics. 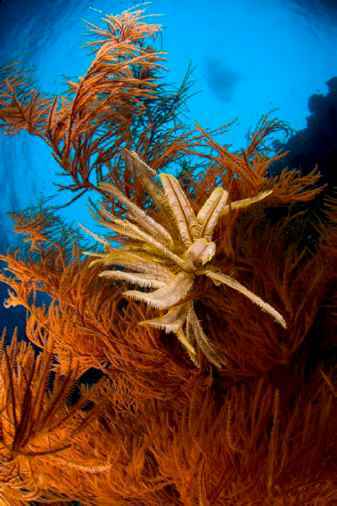 Each kelp plant houses a spidercrab, which are very abundand at this site. Saga reef proves that diving at the arctic can be as impressive as diving in the tropics. 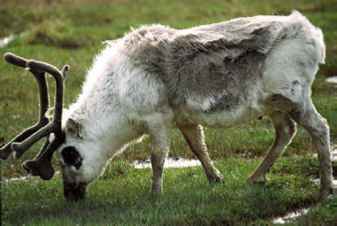 reindeer wander across the tundra. The main reason for going to the arctic is the search for animals that are unique for this part of the world. Every day is spent searching for polar bears, walrusses, seals, beluga's etc. During one of our searches for a polar bear we were surprised by a group of White Beluga's. The scenery at the arctic is overwhelming. You will see lots of stunning landscapes, icebergs and big glaciers. The guides will always carry guns during diving and land tours. Polar bears are quite abundant and you don't want a very close encounter with them. The guns will only be used for protection. As the Polar Bear is a protected animal, active hunting is forbidden. We have seen some polar bears, unfortunately not close by. The expedition leader told us that the bears sometimes come so close that they are leaning against the vessel. 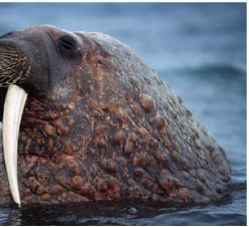 The island of Moffen is very famous for it's population of walrusses. The animals at Moffen are protected and you are not allowed to come closer than 300 meters. But with a little bit of luck another group of these animals is found outside this area. You'll be surprised by the size of these animals. When aproaching a group of walrusses carefullness is required. The water is a safe haven for the animals. This means that you should never be between the walrusses and the open water. The animals are not really afraid and seem quite tame. It's key that you don't make any unexpected movements. The captain was even able to manouvre the vessel against some floating pieces of ice with sleeping walrusses on them. Some places on Svalbard remind us of the long history of the islands. Examples of these places are Smeerenburg with the remnants of a dutch whaling station and Danskoya an old danish whaling station. These two deserted whaling stations are very close to the area from which adventurists tried to reach the Nort Pole for the first time. The foundations of the baracks of one of these expeditions can still be found. Barentzburg, which is the only remaining Russian city on Svalbard will be visited at the last day of the tour. The people in this city live from the last remaining mines on the island. After this visit the boat is going back to Longyearbuyen. For some this is the time to leave Svalbard. But if you want you can stay a few days more to enjoy the flowers, plants and birds of the main island. Big five, big fish, big adventure. South Africa should by now be well and truly established as the shark capital of the world. The breaching Great whites of the cape region have been well documented and photographed . The Dusky sharks and Bronze whalers feeding frantically in the annual sardine run have been elevated to immortality by Doug Perrine's award winning images. Toothy Sand tigers or Raggies (odontaspis taurus), as the locals call them affectionally, have been a staple on subtropical dives. Their ability to hover motionless in the water has taken them into the heart of photographers. And since the dive industry has established itself in Mozambique good sighting reports of whale sharks are coming in on a regular basis. Over the top on the adrenalin scale however must be the tiger shark diving at the Aliwal shoal South of Durban. No cage, no bottom, no fear (my foot). African Watersports has taken adrenalin junkies, shark lovers, photographers and the chronically curious out for five years now to dive with these spectacular creatures. 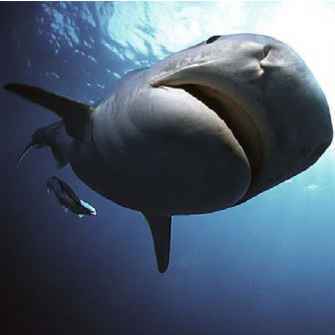 Tiger sharks appear on the Aliwal shoal seasonally around May. No one knows much about their migration pattern the rest of the year or why the come to the shoal. The tiger encounters have evolved from a more cautious approach of feeding them on the reef, carrying defensive weapons to the current mid-water drift encounters (where no one carries so much as a dive knife). Walter redefines nonchalance when it comes to, what I had to date considered beyond the limit of the safely possible. Tiger shark motion portrait1 Nikon F90,18mm, Snbal housing, Velvia 50,fll, 8thl sec, 2 x Nikon SB 105,fidl power is possible to meet these magnificent creatures close up. It's your wit vs. the sharks and the opportunity to photograph one of the most beautiful predators of the sea, makes this dive easily the most exciting wildlife encounter I had in 20 years. Tiger shark portraitI Nikon F4,16mm fisheye, Subal housing, Velvia 100, fll, 125thlsec, single YS300 Sea&Sea strobe 112 power strong tiger-like markings, boxy snout and fold on the corner of their mouth make them instantly recognizable. Walter uses a stainless washing machine drum on a steel cable as chum bucket, because the plastic containers got chewed up every time. The bucket drifts five meters down on a float with the current i.e. you drift in mid-water with the sharks circling the bait. The fact that people encounter tiger sharks in this way now, questions seriously the scary myths surrounding this species. I have no problem to admit that this was right at the edge of my comfort zone though. Especially when the viz got below 5 meters. The tigers cruise sluggishly for the most part, but they do try it on as they gain confidence the longer you spend with them in the water. too, given equality in size. They nibble cameras occasionally, but surprisingly don't apply pressure and let go again quickly. Easier on the gear and their teeth. I felt a bit sorry for the guys hiding behind matchbox-size digital cameras (until I remembered the $ 600.- excess luggage bill from Quantas) and I did wish for my Mamya 6x7 housing at times for added comfort. 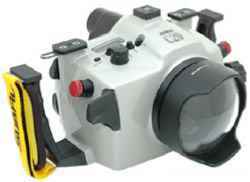 Any contrast, like colorful dive gear or aluminum wings on video cameras seemed to attract their particular attention. I never understood why underwater camera housing manufacturers aren't painting their products black for stealth and non-reflectiveness like land cameras. 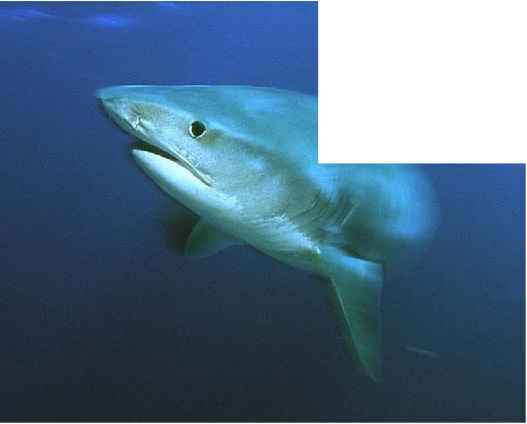 On several occasions a small pointy nosed whaler shark (poss. 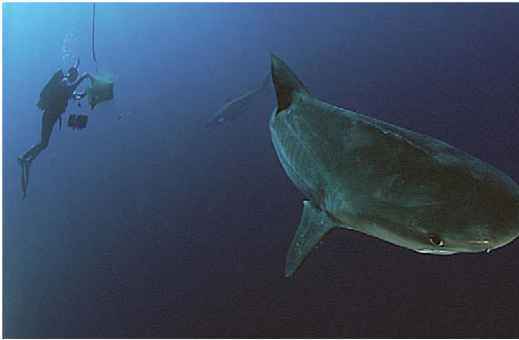 carcharhinus brevipinnas) swam between the tigers at apparent ease. The Shark Board tags are a bit annoying for the pedantic photographer and probably the shark as well. This organisation has taken it upon itself to net the swimming beaches of Natal. Life sharks caught in the nets are tagged and released. More often the sharks drown before the nets are checked and the dead sharks are dissected for scientific research. The lab is open for visitors with a stomach for a shark stomach. Things like dietary habits and reproduction cycles can be learned from dissection, but I think you learn infinitely more about this fish getting intimate with it in its own element. Over several days I could recognize some of the same sharks and their individual behaviour towards the divers. Walter Bernardis's fearlessness and love for these sharks is an inspiration and instrumental to introducing divers to this unforgettable underwater wildlife encounter. And there is no better place like Africa to meet a tiger. UwP issues are downloaded by over 33,000 underwater photographers worldwide and we can guarantee they are all interested in underwater photography. No other diving publication can make this claim. So if you are an underwater photo equipment manufacturer or retailer, dive travel agent or dive resort you will not get a more targeted audience. UwP is a truly international magazine. Promote your products/ services to the world. 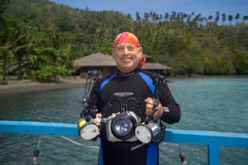 When diving most areas of the world, if I have a choice to either take a quality liveaboard or stay at a land based resort, I will always take the liveaboard. As a matter of fact, taking a liveaboard charter not only offers the best diving experience with its ability to visit dive sites that a land based operation simply can't reach, it is also certainly one of the most relaxing dive vacations one can imagine. No phones, no TV, just great company, great food, and great diving. Once aboard you never have to move your gear, be late and miss the boat for the morning dives, try and figure out when or where to eat (whiney voice: Honnney, where do you want to eat tonight!? 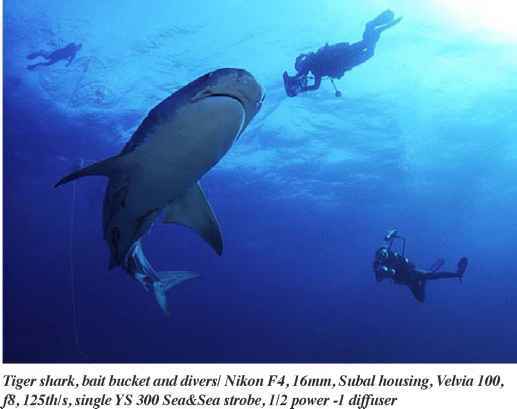 ), and endure all the other inconveniences of most land based diving. Your gear is set up once, with tanks filled at their stations, and you can't be late because "you're already there". The Kararu Liveaboard where I spent 11 days diving in Indonesia. Kodak SLRIn 24-120 VR Zoom dive just may not be such a big deal. Excellent meals are served on board so going hungry is just not an option. A Kararu guest takes time out for a good book and some sun. 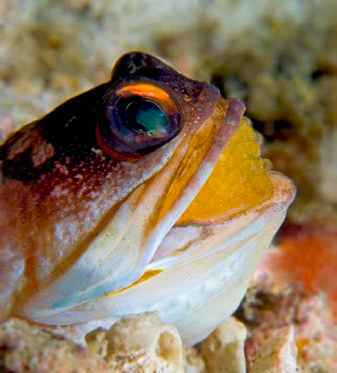 Not only great for the underwater photographer, it's just a great dive vacation. As one liveaboard guest once told me, "Where can you take a vacation and take your shoes off at the beginning of the week and not put them on again until you leave at the end of the week?" 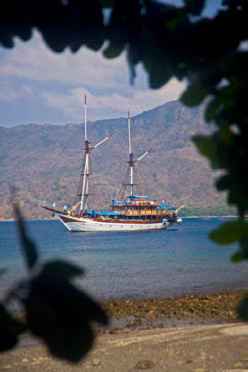 While I have done liveaboards in the Caribbean, Fiji, Tahiti, Australia, Hawaii, and Micronesia, I had never done a liveaboard charter in Indonesia. As a photographer committed 100% to shooting digital, I wanted make my 11-day, 650-mile charter an opportunity to push the envelope of my digital skills. perfect for housing, port, and strobe storage. Make sure to carry extra tools, o-ring grease, and other necessary spare parts. Labeling your small items is key to staying organized. My goal when setting up my photo gear is to be as organized as possible so having my tools in a dedicated tool bag, parts and accessories in their own bag, strobe arms in their own bag, etc, just helps this process. As any quality liveaboard should, the Kararu had a large, dedicated camera area with individual storage space so I could keep my lenses, ports, and other accessories off the actual camera workspace. 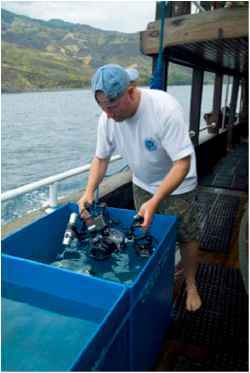 Keeping all accessories dry and separate from dive gear is a big liveaboard advantage. One of the most important things I do is to place several silica (drying gel) packs inside the various bags as well as the inside the housing itself. Considering the sensitive electronics of digital cameras, this provides an extra margin of safety for keeping everything dry in the wet and normally humid environment of a diveboat. A full charging station. Both 110v & 220v power is available on the Kararu but you should have extrapower adapters and plugs whenever you travel abroad. Part of my setup process is to locate and organize the battery charging area. Some boats will have the charging stations directly on the camera table, normally on one of the lower shelves. Others will have a separate, enclosed area right off the dive deck. The Kararu had theirs located inside the main salon area. Conveniently, they had both 110v and 220v power strips connected to a large multioutput surge protector, so both laptop computers and chargers were safe from any unexpected surges from the boat's generator. Most current model battery chargers will accept either 110v or 220v power but you should check yours to make sure. Some older models will only accept one or the other, depending on its country of origin. Having a small power converter and various plug adapters is always a good idea when traveling internationally. Since I travel with so many digital accessories, I always bring my own power strip. I purchased one that can take either 110v or 220v input, so it will work anywhere. Unable to buy this type of power strip at my local hardware store, I found a specialized source on the Internet and it is one of the best $50 investments that I have made. (Do an Internet search for "power converters"). I use an inexpensive Brother tape label machine, available at any major stationery store, to make my name labels. These labels are actually so waterproof that I use can use them on my underwater photo gear and they will usually last a number of trips before I have to make new labels. Once the housing is setup, I do a thorough camera and strobe check. Again, I have given everything a complete "twice over" before I even packed for the trip, but "sh_t happens" so I want to make sure I don't have a surprise when I make my first dive. I charge all my nickel metal hydride strobe batteries, my camera batteries, and my pointer light battery. I make sure my 2 gig compact flash cards have been reformatted, just to make sure that they are empty, and I make some test exposures as a double check of the camera, strobe, and memory cards. Because of the large, dedicated camera and battery charging space, this whole setup process went by without a hitch. So how does working from a liveaboard differ when shooting digital vs. film? Well in general there isn't much difference. The convenience factor is still there for both. Since many film shooters don't even process most of their film on board, their task is over once their dive ends. But with possibility of many hundreds of image files during a weeklong liveaboard, the digital workflow does get more demanding if you want to work with your image files while on board. A large common area salon makes working with your digital images convenient and fun Sometimes you get lucky. I had my own desk that I set up as an on-board office so I would work to my heart's content. A laptop computer is invaluable for viewing images and sharing them with others. by liveaboard diving is having immediate access to my computer. While some digital shooters wait until they get home to organize and / or edit their images, my laptop and Photoshop are almost as important as my digital SLR and Light & Motion Titan housing. 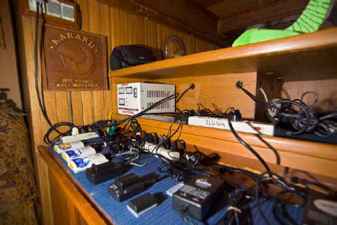 A large liveaboard, like the Kararu, is the ideal place for organizing and post editing your images. Before arriving in Bali, I expected to find a large salon area with plenty of table space and power outlets to make my computer life easy, but I was really happy to find that my stateroom had a table area and lots of extra space so I could set up a little office right in my own room. This gave me the flexibility to keep my computer set up and my external USB 2 devices (Sony GigaVault hard drive and compact flash card reader) always plugged in and ready to go. I asked the Kararu's cruise directors, Linda and Karl, if they have seen an increase in digital shooters over the past few years and their answer was an unequivocal "yes!" and while I was onboard there were a number of digital shooters and only one photographer using a film camera. Of the digital shooters, several were new to their camera and housing systems as well as image editing software. The large comfortable salon provided the perfect community workspace for both new and experienced to share their images and seek out advice. One item that was available on the Kararu (and which I expect will soon be as standard as the old reliable slide projector) was a digital projector that could be easily attached to any computer so anyone could present a digital slideshow of their work direct from their computer. opportunity for some interesting land excursions. During the 11-day charter I kept 330 underwater images and almost 200 topside images (this does not included the images I deleted) so I had lots of images that needed organizing and that I wanted to check out while on board. 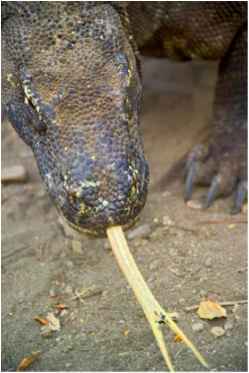 In addition to the fabulous diving, the Kararu offered a land walk on Komodo Island, which included close sightings of the famous Komodo Dragons, as well as local island and beach visits. Needless to say, both the underwater and topside photo ops were incredible, and being able to view and organize my images right away while on board was, to say the least, extremely convenient. Using the Photoshop CS Image Browser I was able to view, rename, and organize all of my images. I was able to select and edit my "keepers", and using the file browser "automate" function, prepare a web gallery that I posted on my website once I got home and I used Ulead DVD Picture Show to create a fun slideshow that I presented at the end of the charter (although I could have used the Photoshop "PDF Presentation" function as well). I had a fantastic 11-day trip on the Kararu, met some really nice people, had great diving and best of all got some great images.